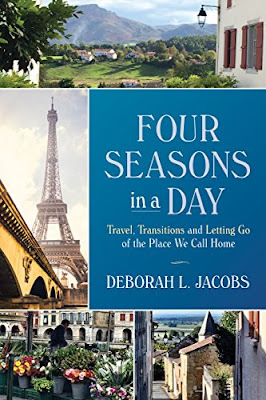 My review today is for the newly released travel memoir Four Seasons in a Day by Deborah L Jacobs. This is a book the author never planned to write, but writing it helped her with the transition between being an unhappy content writer and her new future. It is the story of a husband and wife, married for twenty-five years, who are always looking forward to their next adventure together and decide to rent out their family home in Brooklyn, New York to finance a three-month trip to France. Taking advantage of the sharing economy; online transactions where you sell or swap goods and services, they carefully prepared their home for listing on sites like Airbnb, HomeAway and SabbaticalHomes, and equally carefully researched a three-month rental in France, or so they thought. Finding themselves in a cottage in the Loire, not quite as ready for them as they were for it, the start of their adventure didn’t live up to expectations. Having lived in rural France for over twelve years, I guess I’ve forgotten how different life here can seem to a new arrival, especially one from New York. Her frustrations with quirky door locks, temperamental oven ignitions and unexpected power outages made me smile as I thought, welcome to my life in France. However, despite their disappointments they continued with their adventure, which ultimately took them to some previously unplanned areas. Their willingness to try and speak French, to become regulars at the local markets and to seek out places on and off the tourist map is to be commended and I’m sure enhanced their stay. Deborah, like I am, is a fan of Coffee Break French, a regular podcast to help improve your French, for all levels. My favourite section was when they were in the Pays Basque. They were more settled, her writing felt happier and I too have a soft spot for the Basque cuisine. Food plays a major part in this book and whether describing the market produce they buy, the dishes they prepare or the meals they eat out, your appetite for French food will be awakened. Deborah has more experience of the Basque area than I do, having spent six weeks there as opposed to my two short visits, so I enjoyed learning from her and took plenty of notes that came in useful for our recent holiday there. This book will appeal to those (especially from the US) who like reading about travels in France, but would also be a useful resource for others looking to do a similar thing. As well as their own personal experiences, Deborah, a journalist with a background in contract law has neatly summarised the dos, don’ts and pitfalls of using the sharing economy, which is especially important when listing your main residence rather than a second home. Four Seasons in a Day is available in ebook format and I'm delighted Deborah will be joining me here on Friday for my France et Moi interview feature. You can follow Deborah's adventures on her Facebook page here.